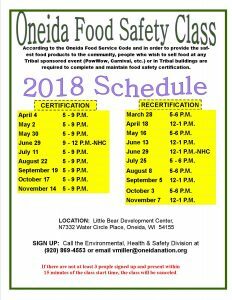 The Oneida Food Service Code requires all individuals who wish to sell food at any Tribal Event or in Tribal Buildings to complete a Free Food Safety Class. Our aim is to educate our food providers and have only the safest food products served in our community. All classes must have at least 3 people signed up and present within 15 minutes of the start time, otherwise the class will be cancelled. Complete Food Safety Course Certification, verify your food safety certification is current. Contact the Oneida Public Health Sanitarian at (920) 869-4553, or [email protected] at least two (2) business days prior to the event with date, location, and time. The Oneida Public Health Sanitarian will inspect your facility to ensure compliance with Oneida Food Service Code prior to the start of the event. If inspection is successful, a temporary license will be granted on-site. Obtain insurance for your food establishment. Oneida Public Health Sanitarian will review and contact you via next steps. Insurance is not required for Independent Food Vendors, but is highly recommended. All vendors are required to have one (1) person on site at all times that has proof of a current food safety certification. For profit vendors are required to prepare food in a Tribally Approved Commercial Kitchen. This does NOT include your home kitchen. Licenses will be granted through the Oneida Licensing Department after the Oneida Public Health Sanitarian has completed a successful inspection and approves the application requirements. Vendors who are not for profit or are raising money for a benefit or donation, are not required to have Food Safety Certification, nor are they required to submit an application or undergo inspection. 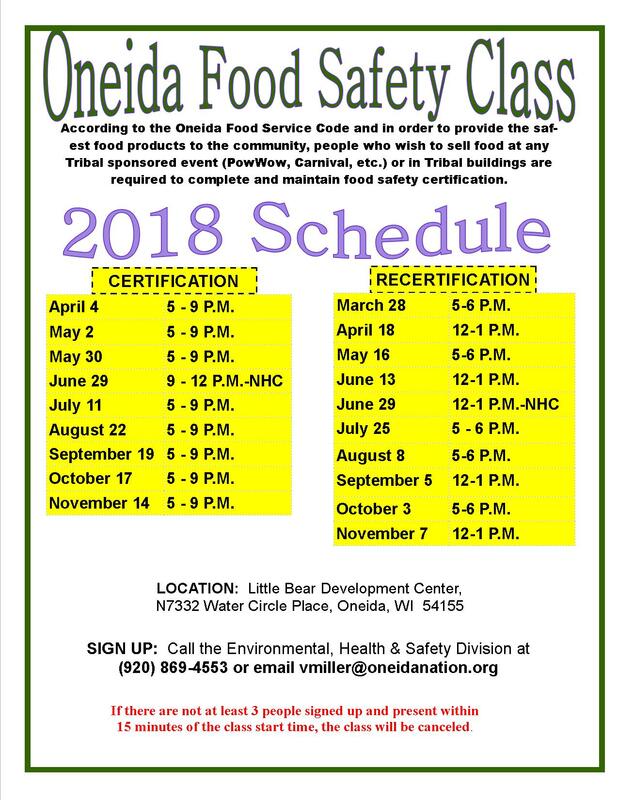 It is highly recommended that at least one (1) person involved in the preparation of the food for the event attends a Food Safety course or has knowledge of the Oneida Food Service Law. For more information contact Vanessa Miller, Public Health Sanitarian at 920-869-4553. September 2015: Oneida Conservation Department public notice concerning elimination of services. The Conservation Department does have firewood available at our office located at, N8047 County Road U, however, all hardwood firewood (oak, hickory, maple, ash, birch, etc.) is strictly reserved for wood deliveries made to the elderly and handicapped tribal members who live within the reservation boundaries. The Oneida Conservation Corps (OCC) process and deliver hardwood reserves throughout the winter months. Elderly delivery services begin on November 1st and end on April 1st of every year. Those needing wood can call in to the Conservation Office at (920) 869-1450 to be added to our “Firewood” list. All wood is on a first-come-first-serve basis until supplies are gone. To maximize our distribution services, elderly and handicapped customers will receive one (1) load (approx. 1 face cord) of firewood per request. Softwood (willow, aspen, boxelder, cottonwood, basswood, etc.) is available to any Oneida Tribal member, however, processing (sizing, splitting) and delivery services are not provided. Softwood is available for pick-up daily (Monday-Friday 8:00am-4:30pm) on a first-come-first-serve basis until gone. Recipients must report to the office prior to picking up wood. Our goal is to maximize the use of community waste wood materials and provide processing and delivery services to those most in need (we do not buy firewood for distribution). Our primary objective in offering winter firewood is to help subsidize a portion of home heating costs across a wide customer base – not entirely replace other conventional heating sources (it is advisable that people do not become overly reliant on this service or on the availability of firewood). The Conservation Department also authorizes Wood Cutting Permits. Tribal members are permitted to cut and remove down and dead trees from rural tribal properties. Permits can be obtained from our office Monday – Friday 8:00am – 4:30pm. Permits are $5.00 each and are valid for 30 days after which they will have to be renewed. The permitting process allows our department to monitor non-destructive tree cutting activities. Wood obtained through the Conservation Department or via Wood Cutting Permit is for personal use only and cannot be sold or exchanged for goods or services. For more information contact Oneida Conservation Department: Office: (920)869-1450. The Oneida Hunting & Fishing Regulations are available online at the Oneida website under Government/ Tribal laws. The regulation book, will be distributed at the Oneida Conservation Department at N8047 Cty U, Oneida, when an Oneida Sportsman License is issued. Any questions, please contact the Oneida Conservation Department at (920) 869-1450. An Oneida Sportsman License is required for: small game hunting, waterfowl hunting, deer hunting (archery and firearm), trapping and fishing, within the exterior boundaries of the reservation. An Oneida Sportsman License is availabe to enrolled members of the Oneida Tribe of Indians of WI, Spouses/Descendants of enrolled members of the Oneida Tribe of Indians of WI, and enrolled members of other Federally recognized Tribes (Other Affiliation). All licenses expire August 31 of each year. License may be obtained from the Conservation Department located at N8047 Cty Rd U, Oneida. Must have completed a Hunter’s Safety Course, if born on or after January 1, 1973. Must provide his/her Tribal Identification Card. and Hunter’s Safety Card if born on or after January 1, 1973. Must Provide his/her Non-Oneida Sportsman Identification Card. EHSD staff is available for presentations on a wide variety of topics as a service for tribal members, schools and tribal departments. Topics include: climate change, recycling, green cleaning, composting, water resources, invasive species, bugs and many more. Contact our office manager at 869-4591 to be directed to the appropriate staff member. Do you have pesty critters around your house and want to get rid of them? Conservation staff will assist in the removal of any non-domesticated wildlife species from residential homes owned by enrolled Oneida Tribal members who live within the reservation boundaries. The Conservation Department also assists with the removal of nuisance animals from Tribal Departments and Buildings. This is done with the use of live traps, as to avoid unnecessary death to the animal that is being removed. Once the animal is trapped, it is then released in a safe location where it will be able to run freely. When contacting the Conservation Department please provide a brief description of the animal, time(s) of activity, number(s) observed and location/type of area the animal may be using. 1. Proof of vaccinations: An itemized receipt and/or rabies vaccination certificate. 3. A copy of a current Oneida Pet License if you live on the reservation. You can bring your paperwork to either N7332 Water Circle Place, Little Bear Development Center, or at the Conservation Office, located at N8047 County Rd. U. View the flyer 2015 Pet Flyer PDF for more information and for local vet discount rates. During the Fall and Winter months, the cold, wet, snowy, and icy weather can be hard on your outdoor pets. Please make sure your outside animals have adequate food , water and shelter for the season. The Environmental Department will have bales of straw for sale at $ 3 each. Please call Steve at 869.4571 to arrange a time to come and pick it up bales between regular business hours. During the FY2016 budget development and approval processes, the BC and the GTC supported the discontinuation of all picnic table sales, rental, and delivery services provided by the Conservation Department as a cost and capacity containment measure. Reminder: Beginning in summer 2016 there will be no picnic table sales; rental; or delivery services to community members for private or personal use so please plan accordingly. Have a plant or animal you would like identified? Contact our office manager at 869-4591 to be directed to the appropriate staff member. Weekly residential curbside trash and recycle collection for Oneida Tribal Members living within the reservation boundaries. To begin service contact Oneida Utilities Department to set up an account and schedule cart delivery. Collection Day and Time: Collection of trash and recycles is conducted weekly on Thursday and Friday. You will receive your collection day when you sign up for service. Carts must be placed curbside by 6:00 a.m. on the day of collection or the night before. If your carts are not out when the hauler comes to collect, they will not be collected until the next weeks collection day, there are no refunds available. Cart Placement: The carts should be placed curb or roadside, out of the way of traffic, with the numbered side facing out (wheels and handle facing your property). Carts need to be placed four (4) feet apart from each other AND four (4) feet away from other objects such as mailboxes, trees, vehicles, etc. Large Item/Appliance Pick-up: For an additional fee, our contracted hauler will pick up your oversize items curbside. The Fee is $15 for one item and $5 for each additional item. – Treat and/or remove dead/dying trees. – Establish new and diverse tree/forest resources. – Preserve culturally endangered, threatened or rare vegetation. For information on woodcutting services Contact Melissa Johnson, Tribal Forester at 920-869-4582. The Natural Resources Department offers limited wood chip delivery to Oneida Tribal Members living within the reservation boundaries. How: Call the Conservation office at 869-1450 to be added to the wait list, let receptionist know where you want the material piled in yard. When: When the department removes trees/limbs, if the wood waste is not needed for the elder home firewood program, it will be chipped and loaded into a truck. If there is a Tribal Member on the wait list, the workers will deliver the wood chips to the first person on the list. There is no guarantee of when delivery will happen, the amount of chips delivered, or the type of wood chips. Please contact 869-1450 for more information. The Natural Resources Department authorizes Wood Cutting Permits. Tribal members are permitted to cut and remove down and dead trees from rural tribal properties. Permits can be obtained from our office Monday – Friday 8:00am – 4:30pm. Permits are $5.00 each and are valid for 30 days after which they will have to be renewed. The permitting process allows our department to monitor non-destructive tree cutting activities. For more information contact Melissa Johnson, Tribal Forester: Office: (920)869-4582. The Natural Resources Department manages a Community Yard Waste Site for Oneida Tribal Members living in Brown and Outagamie Counties. They will accept community yard waste drop-off and offer a limited supply of wood and compost available for pick-up only. Where: N8047 County Road U, Oneida 54155; Please register in the main office first. When: Monday – Friday 8:00 a.m.-4:30 p.m. (closed from noon-1:00 p.m.) and every third Saturday of the month from 8:00 a.m. – 12:00 p.m.
**All other dumping is strictly prohibited.